Dew Tour action continues Friday with women’s ski superpipe from 9-9:45 a.m., women’s snowboard slopestyle from 10:15 a.m. to 12:15 p.m., team snowboard from 12:45-3:15 p.m., and the Streetstyle competition on Washington Ave. from 6-7:45 p.m.
Then, the epic day in Breckenridge will round out with the Transworld Snowboarding Awards at the Riverwalk Center at 8 p.m. 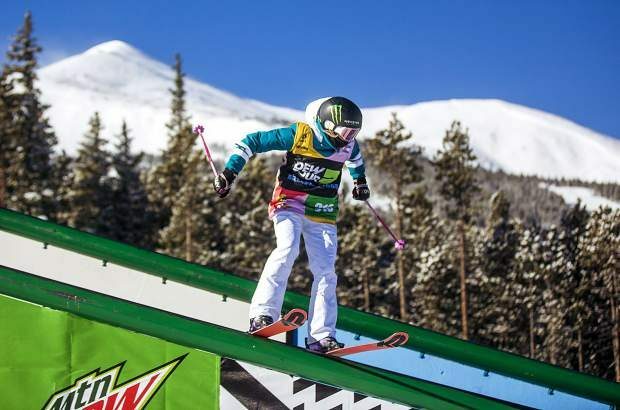 Summit County locals Red Gerard and Kyle Mack will compete today, Red in the jibs portion of the team snowboard competition and Mack in the primetime Streetstyle competition in downtown Breckenridge. Men’s snowboard superpipe 10:30-11:30 a.m.
Men’s ski slopestyle noon-3 p.m.
‘Girls Who Ride’ Streetstyle 3-4:30 p.m.
Streetstyle open to public noon to 7 p.m.
Men’s ski superpipe 9:15-10:15 a.m.
Women’s snowboard superipe 10:45-11:30 a.m.
Men’s snowboard slopestyle noon to 3 p.m.